Birdie Lee Lucas was born on 22 March 1908 in Archer County, Texas. William Madison Lucas and Mary Elizabeth Tenery appeared in the US federal census of 15 April 1910 in Archer County, Texas. Other members of the household included Birdie Lee Lucas. Also in the household were children Emma (age 13), Jack (10), Clyde (7) and John (5). William Madison Lucas and Mary Elizabeth Tenery appeared in the US federal census of 1 January 1920 in Tarrant County, Texas, at Smithfield & Keller Road. Other members of the household included Birdie Lee Lucas. Also in the household were children Jack (age 20), Clyde A. ((17), John H. (14), twins viola and Velma (8), William A. (5) and Ruth M. (3). She married George Wesley Sexton on 23 August 1924 in Tarrant County, Texas. Birdie Lee Lucas appeared in the US federal census of 1 April 1930 in Fort Worth, Tarrant County, Texas, at 306 Twenty-Fifth Street enumerated next to Birdie Lee's brother Jack and his small family. Birdie Lee and daughter Ruth were living in the household of Birdie Lee's husband's brother's wife Norene Sexton (age 20), her son Marshal Sexton Jr. (4) and sister Juanita Gardner (17). She was employed by a packing company as a sausage linker, according to the 1940 census. She married Jack D. Page, son of Jonathan Seaborn Page and Effie Page, on 23 December 1940. 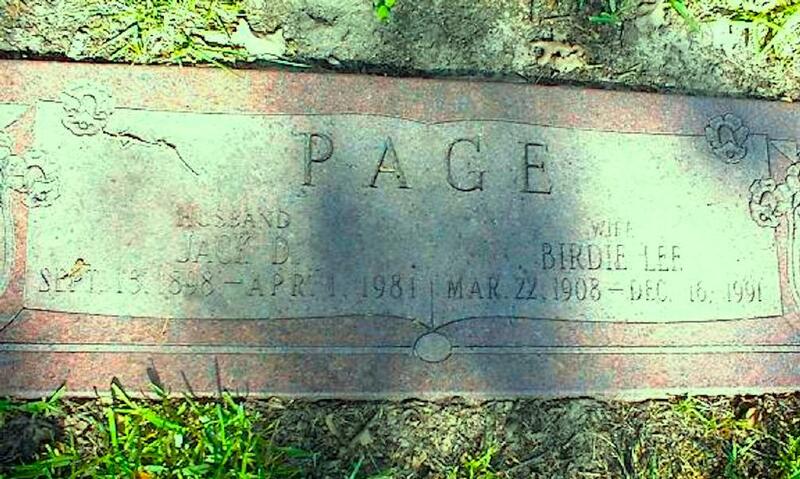 Birdie Lee Lucas became a widow at the 1 April 1981 death of her husband Jack D. Page. Birdie Lee Lucas died on 16 December 1991 at age 83 in Lake Worth, Tarrant County, Texas, at Lake Worth Nursing Center. She was interred at Mount Olivet Cemetery, Fort Worth, Tarrant County, Texas. The following appeared on 18 December 1991 in the Fort Worth Star-Telegram: (Fort Worth) Birdie Lee Lucas Page, a homemaker, died Monday at a Lake Worth nursing center. She was 83. Funeral will be at 11 a.m. Thursday at Mount Olivet Funeral Home. Burial will be in Mount Olivet Cemetery. The family will receive friends from 6 to 8 tonight at the funeral home. Mrs. Page was born in Archer County and had lived in Tarrant County for most of her life and in Lake Worth for 51 years.She was a Baptist. Mrs. Page was married to Jack D. Page, who died in 1981. Survivors: Daughter, Ruth Sexton Ewald of Light House Point, Fla; stepdaughter, Janice Chamberlain of Columbus, Ohio; seven grandchildren; and seven great-grandchildren. A single grave marker identifies the graves of Jack D. Page and Birdie Lee Lucas. 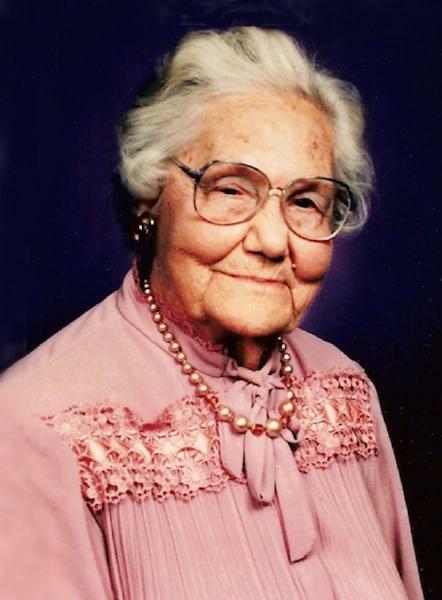 The following appeared in the Dakota County Tribune: Ruth Marie Sexton Ewald passed away suddenly of natural causes on Saturday, February 20 at Emerald Crest Memory Care in Burnsville. Ruth was born on May 1, 1926 to George and Birdie Lee Sexton in Ft. Worth, Texas. She graduated from Lake Worth High School and worked at Carswell AFB. Only child Stephanie was born to Ruth and husband Albert Carl Jacobson in 1946 in Chicago, Ill. In 1952 Ruth remarried Herbert F. Ewald in Ft. Worth and the family relocated to Minneapolis. Ruth enjoyed gardening, music and travelling throughout her adult life and loved her son-in-law Paul Pietrowski as the son she never had. The family wishes to thank the Emerald Crest staff for their devoted care and attention. Ruth was predeceased by mother, father, much loved stepfather Jack Page and beloved brother Wesley. In addition to Stephanie and Paul she is survived by Wesley’s children Melanie (Dan) Cartwright, Sharon (Fran) Scherich and Carey (Janice) Sexton. Private Interment Fort Snelling National Cemetery. White Funeral Home.